Hello friends! It has been heavy in the swing of things as the students return to classes and instructors begin teaching again – which means I have been buried in to-do’s. Usually my weekly bullet journal layout can handle the tasks I have, but since the school year started I’ve needed to adapt my style a little bit – more on that later – in my trusty Rhodia notebook. In that spirit, Rhodia and I have been having fun partnering so we’re back with another bullet journal giveaway! Winners have been drawn and contacted!!! 🙂 If they fail to respond in 48 hours, I will choose a new winner! The rules of this particular giveaway are simple. Follow me, @prettyprintsandpaper on Instagram and like the giveaway photo. Tag a friend if you wish! 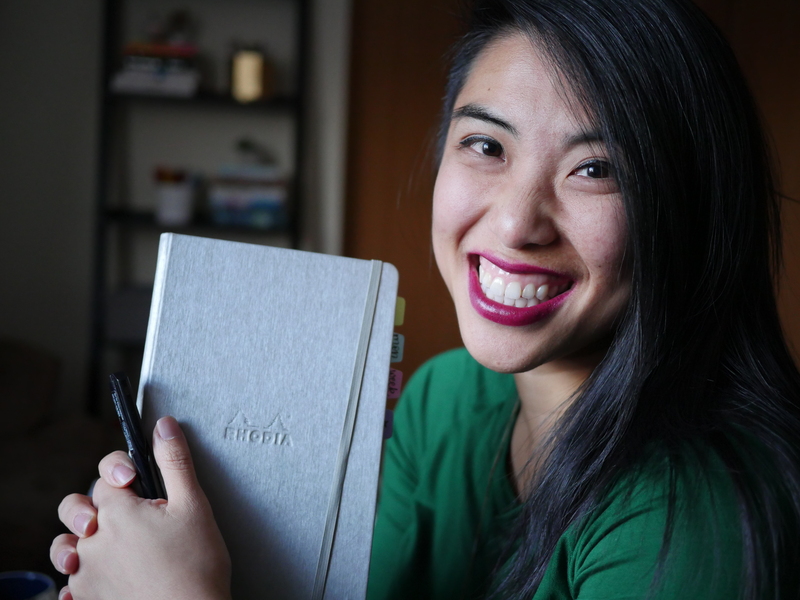 Comment below with 1) the Instagram handle I should look for and 2) What has been the most challenging or rewarding about using the bullet journal system? I will be doing a random drawing based on the comments on this post! YES it is open Internationally! I will stop counting comments for the giveaway by midnight CST on Tuesday, October 3, and contact winners via Instagram Direct Message within a few days after that. Winners will have 48 hours to confirm their prize before I move on to another winner. The most challenging part for me is figuring out what layout works best as each week is so different and sometimes I have too much space while others, not enough. But the most rewarding is when I flip back through my pages and see how much work I’ve gotten accomplished! The most rewarding thing about bullet journaling for me is actually sticking with a planning method – the most challenging is not getting caught up in all the fun supplies and pretty spread ideas. I love that I can customize it to my needs, which can change week to week or month to month. I’m not bound by the restrictions a traditional planner has. I can be as elaborate or minimalist as I want in one book! I struggle with being present: being present with my friends and family, during meals, at work, etc. I’m always thinking about something else and end up mainly going with the flow. However, the bullet journal system (dailies, habit tracker, and journal combined into one) has helped me center myself and keep an eye on the prize, so to speak. I now have a focus for each day and can tick off “accomplishments” as they happen. I wind down the day with some quick journaling. I track important habits to keep myself accountable. I complete the necessary work tasks so I get what I need to do done. It’s easy to slide back into “automatic” mode, but the bullet journal is slowly and surely helping me keep my eyes open and myself centered. Bullet Journaling really helps with my anxiety. My life is so hectic, and the planning really helps me keep everything in perspective. I just love how much I can change my bullet journal. I struggled the most with finding my own style I think. That happened to me too! But chill, don’t let that stop you from being you in your Bullet Journal. Wish you luck! I think the most beneficial thing is that it forces me to be creative at least once a day whilst balancing my life. The challenging thing is to not make it more cumbersome than it is, or just getting over myself when I track habits in it. Hi Kim, look Bullet Journal is like my BFF. But then like every best friend, we have fights. She wants me stay on track but sometimes I mess up. The most rewarding thing is, you get a safe place, a place to keep your secrets and protect your memories in your own way. Bullet Journaling has made me realize that I am my own person, I am not the best but there is surely no one like me. And most challenging part is, wel, overcoming myfear. Sometimes I fear I am just too uncreative, too different, my bullet journal isn’t good enough and all that stuff.But I overcome it, for my love for my BFF is deeper and stronger than my fears. P.S. Thanks for this opportunity!! Hi Jess, look Bullet Journal is like my BFF. But then like every best friend, we have fights. She wants me stay on track but sometimes I mess up. Hi!!! I am @naturaldancer on Instagram & I LOVE your page!!! Bullet journaling has opened a world of creativity that I never knew I had! It’s inspired me to do more & dig deeper!!! The most rewarding thing about Bullet Journalling is Freedom. Freedom to try out different layouts, colors, spreads. I love that I choose how I want it to work for me. Traditional planners always made me feel like I had no life on days when everything was empty for whatever reason. In a bullet journal, if I don’t have anything going on, that’s fine, I can just pick up whenever I need to or I can journal or use the space creatively. I love that anyone can look at my journal- hopefully my children when I’m old and gone, and get a sense of who I was and how I loved them. The most challenging part for me is being consistent. Some weeks I’m really good but other weeks I don’t even open my journal. The most challenging part of journaling for me is knowing what colors to use while creating different patterns in the journal, what colors look good together and what colors don’t and how to take advantage of the diferent tonalities of a single color to make the planner perfect! 🤗🤗 buuut once you experiment different combinations you get better at it, practice makes perfect! Using a bullet journal can reduce my procastination. With highlight and stuff. And the most challenging is to always consistent of what we have written on it. It’s been so challenging for me to stay with a notebook binding option. I kept switching, and switching until I found myself getting lost in the process of setting my BuJo up instead of the important part which is using it as a tool to make me productive and on track with life. This very struggle has been rewarding as I have completely customized the system itself in a discbound notebook and love it so much! FINALLY!! 😁 I decided to buy custom paper (Munken Polar bright white), have it cut to A5 format, make my custom dot grid, and print my own inserts. So worth my struggle! The bullet journal system seemed to have combined my cravings for creativity and planning yet while learning the system I found myself getting lost with ideas I saw online. I had to take a step back and build up to what worked for me and what didn’t. It’s been really helpful for office use because I get to customize how I “see” my work and keeps it fun. I love it. The most challenging thing is having too many styles and as a newbie trying to pick the one that best fits me. The most challenging for me is looking at my journal and knowing it’s good enough, not comparing my pages to others. What I do works for me and that’s the main purpose! My bullet journal journey has evolved from college into my ever changing fast paced adulthood life. The most challenging part about this was keeping up with layouts when life got in the way and I hand to keep up. @thebonjourjournal is my insta and the most difficult thing is making sure to stay creative (at least for me). I love the function of it and being able to do some artistic things. My hardest thing is the investment in the tools. I have absolutely loved planning in my bullet journal and it has been therapeutic making it beautiful but a new notebook would make it that much better! I love having a record of my days and being able to lay things out and moving them around until they make sense! I tried bullet journaling about one year ago but failed after setting it up. I think I just made it to complicated. So this time (I’ve been doing it again for about three weeks) I have purposely kept it really simple, so the most rewarding thing is that I am actually using my bullet journal and am getting my ‘to-dos’ actually done in a timely fashion. I thought I had entered this giveaway when I originally saw the post. Don’t know what happened there😒 hmmm. The most challenging thing for me is trying to keep at it. I get distracted really easily and kind of leave tasks incomplete without realising (kind of like what happened with my first go at entering the giveaway) that was the reason I started a bullet journal in the first place. The most rewarding thing I think for me has been finding more of myself each new page I create. Without saying too much I have been struggling along in an psychologically abusive relationship until July (coincidently the 4th of July) and my bullet journal helped me vent, decompress and also realise that I wasn’t just imagining things because I started noting things down I could see everything more clearly — I don’t know if you’d call that rewarding as such but it sure helped me redefine my priorities and walk away. Best thing I ever did. The most challenging for me is new layouts and keeping up every day and the most rewarding is definitely seeing finished pages at the end of the month! Really hope I’m not too late! I’m @brandice on Instagram and I’ve struggled to keep bujo interesting and fresh recently and would really love to mix it up to get myself back in a fully engaged mental space. What has been the most challenging part for me is the layout. I completely understand that you make it yours but it can be quite intimidating when you follow so many bullet journal accounts and see how beautifully laid out their’s are and you try to get inspiration but often times it just becomes frustrating. I’d love to give it another try and maybe this time, follow what moves me each week. If it’s doodling one week or just words the next, it’ll be my bullet journal style. The most challenging part of bullet journaling for me is keeping up with it. Every 4 days I am on call where I work in the hospital for 28 hours in a row. I then sleep most of the next of the day, try to get a handle on my life for the next two days and then it starts all over again. It is easy not to write in my bullet journal for days and even weeks at a time when my schedule is like this or when I feel down and tired. But I can’t wait to start a new journal where I can be more creative and artistic which will motivate me to post more consistently!!! I just started earlier this year. Hard to gauge how many pages you might need if you want to change it up during the month. I don’t love having to add my own dates. Maybe I’m lazy…not my fave! I need to find right book for next year. The hardest part for me is accepting that my bullet journal won’t be super pretty and arty like the ones I see. I am still new to this, but I love actually having everything in one place. When I need a planner, it’s a planner, when I need a diary, it’s a diary, when I need a notebook, it’s a notebook. 2) Rewarding is that I can actively see myself reach goals, I track a sport and I’m amazed to see the numbers improve and my skill get better. It’s also amazing to see myself be more actively involved in bettering myself. The most challenging part is accepting I’m not super artsy so don’t have the beautiful pages like other people. I’m practical so I’ll stick to that!